Okay now this story has no real title. It is simply a part of the larger Lost Worlds story arc. Some fans actually consider it a part of Legion, but personally I’d rather consider this the story after and Legion separate short stories so I am going to review them as such. I will simply refer to this therefore as the Lost Worlds part 1. Deep into the forbidden space Dan decides to investigate a planet where all of the colonists went missing. Apparently the entire planets population just vanished without a trace despite the fact that the planet was a seemingly uninhabited sand world. As soon as Dan and a team land on the planet they discover the horrible truth that the planets sand is alive and carnivorous. It consumes several of Dan’s team and traps the ship in a living sand storm. Dan’s death rays are ineffective against the living sand storms that begin attacking and killing his men reducing them to nothing but skeleton’s. Fortunately Dan is able to release the water from his ship which releases it from the Sand storm. He then uses the ship to affect the planets atmosphere and make it rain which weakens the sand and allows Dan and his crew to fly off into space. A short story with an interesting and somewhat wild premise of living sand. After featuring more traditional monsters in Legion I feel that this strip was something of a return to the earlier 2000AD adventures where the villains were a little bit more over the top and frightening. The idea of living sand dragging you under or tossing you about in the air and flaying you alive is a pretty crazy idea that almost borders on the fantastical. Though the strip does have a very smart and logical, scientific conclusion at the same time when Dan makes it rain to beat the living sand. Some of the artwork such as Dan’s men having their flesh ripped off is quite striking and effective too. I think this story sets up the pattern of the Lost Worlds story arc quite well for the next couple of issues where Dan and his men will land on a planet and think everything is normal at first, and then something ordinary will turn out to be a carnivorous monster that will eat several of Dan’s team. It does make the Lost Worlds story arc a bit formulaic, but still a lot of fun at the same time. Overall whilst not a bona fide classic, this is still an interesting, amusing short adventure for Captain Dan nonetheless. Vern the sand world of Blake’s 7. A much later episode of the final season of Blake’s 7 called Sand features almost exactly the same premise as this story. It sees the crew of Scorpio arrive on Vern a seemingly uninhabited planet to find out what happened to the colonists there. They discover that the Sand is alive and has eaten them. The sand very nearly kills the main characters until Avon using the ship the Scorpio is able to make it rain and weaken the sand (which managed to trap Scorpio in a sand storm) after which everyone is able to escape. This episode was written by Tanith Lee who was an acclaimed author outside of her work with Blake’s 7. This Dan Dare story was most likely an influence on Sand. Of course whilst Sand does have a similar premise to this Dan Dare strip it is still able to take on a life of its own. Sand is more of a character piece focusing on the dynamic of Tarrant and Servalan who are trapped in the base together. Still its worth noting that this is another example at least of how Dan Dare was a precursor to other prominent works intentionally or not. Does Dan Dare take place in the same universe as Blake’s 7? Personally I think that Dan Dare and Blake’s 7 occupy the same fictional universe. 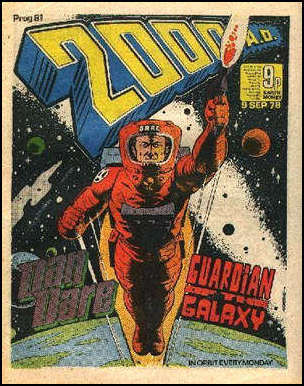 There are many similarities between the 70’s Dan Dare and Terry Nation’s classic series. Both the Blake’s 7 and Dan Dare Federation’s are shown to perform horrific experiments on people and stamp down on the most minor crimes with the most severe punishments. Both even have whole planets where they dump their criminals. Then of course there is the fact that both also have planets where the sand is alive and eats people. Dan Dare 2000AD is set 100 years before Blake’s 7. Dan Dare 2000AD is set in the late 22nd Century, the year 2177 AD to be exact. Blake’s 7 meanwhile according to Terry Nation was set in the late 23rd Century. In my opinion the already corrupt organisation we see in Dan Dare eventually became over the course of the next 100 years a fully fledged empire and conquered other alien races leading to the events of Blake’s 7. Thus the sand planet in Blake’s 7 is the same as the one in this Dan Dare strip, 100 years later. Presumably records of Dan’s visit to the sand planet later named Vern were lost in the 100 years. Whilst there was no official crossover between Blake’s 7 and Dan Dare, but they are both linked through Doctor Who. Doctor Who had a crossover with Dan Dare and Blake’s 7 in spin off material. Thus to me all 3 occupy the same canon. They actually all fit together quite well. In Classic Who the Daleks invaded the earth in the 22nd century and were repelled by the later part. Thus to me it was the Daleks who brought about the end of the original perfect society in the first Dan Dare comics. After their invasion was repelled the Federation came to power and earth rebuilt itself in a short amount of time (with the aid of those aliens that the Mekon tried to assassinate) and established the Federation. In the following century the Federation however became more corrupt and those aliens left. The Federation became openly hostile to alien life due to the Dalek invasion and became determined to make earth a strong power base leading to the events of Blake’s 7. Incidently I wrote about other continuities I think share the same universe as Doctor Who. Check it out if you have the time, but basically I feel that Dan Dare both the original Eagle strips and the 2000AD strips and Doctor Who and Blake’s 7 all occupy the same canon. This is the only story in the Lost Worlds arc where Dan mentions searching for survivors. It can therefore be assumed that no other earth ships made it further into the lost world’s territory and from this point on Dan is simply exploring.